Sources close to the crew of ‘Puli’ reveal that the producers are yet to settle the due remuneration for the technical crew. It’s buzzed that they promised the workers to settle it along with the next venture or after the release of the movie. The technical crew has no choice but to agree to their proposal as they’re also being roped in for the producer’s upcoming flicks. On an another note, sources close to the crew reveal that actor Vijay has requested the crew for a special preview. Though the exact reason is unknown, some state the Actor Vijay wants to make sure of his performance before releasing it in the theatres for global audiece. 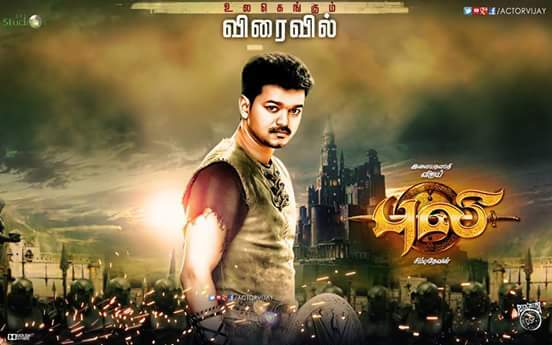 ‘Puli’ is directed by Chimbu Devan and produced by Thameems as a joint venture with P.T. Selvakumar. This project has an ensemble star-cast of Hansika Motwani, Shruti Haasan, Sridevi, Sudeep and many others whilst Devi Sri Prasad is composing the music.